Eggplant Parm is one of my favorite comfort foods, but most are filled with breaded and fried eggplant, and tons of cheese. My LivLight version is vegan, gluten free, super simple, and absolutely delicious. Hope you’ll give my easy and yummy Eggplant “Parm” a try and let me know what you think! Also, don’t forget to tag me in all of your foodie creations at @livlight_ and #livlight. Preheat oven to 450 degrees and line two large baking sheets with foil or parchment paper. Cut eggplant in 1/4 inch thick rounds and sprinkle with salt. Place in a strainer and allow to drain in the sink for 30 minutes. Wipe any additional salt and water off rounds, place on lined sheets, and spray both sides with olive oil spray. Bake until soft and slightly browned, flipping halfway through. In the meantime, warm sauce in a small pot. 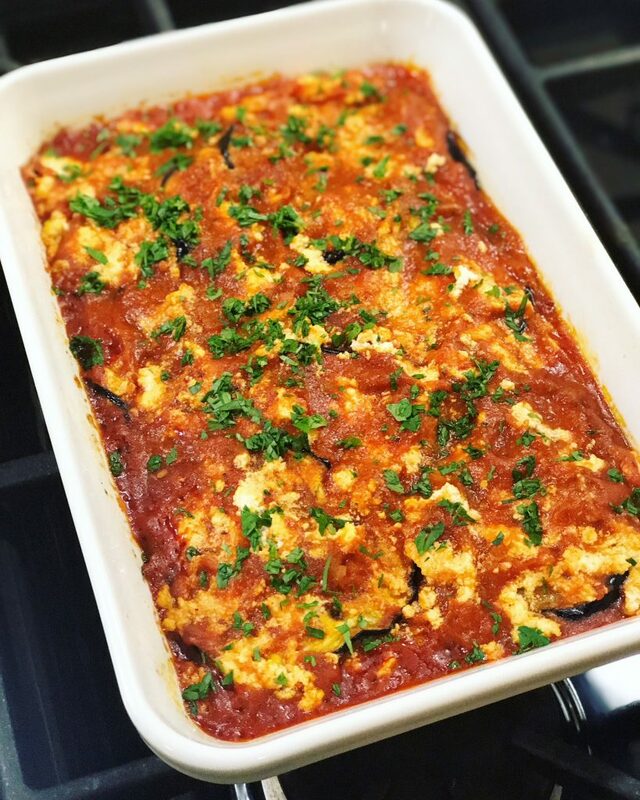 After eggplant has cooked, begin to layer in a 9×12 baking dish. Begin with a third of the sauce spread along the bottom, top with half of the eggplant, and blobs of chesse, and then repeat. Top with final third of sauce and any additional cheese. Bake at 400 degrees until hot and bubbly. Garnish with Italian parsley.